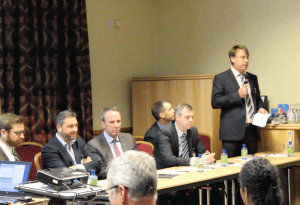 As some of you will know, last week we hosted a free Heat Pump Conference at the Maidstone Hilton, and what an event it was! 85 guests were in attendance on the day, with 25 suppliers, manufacturers and Reina Group staff to help make sure that the day was a great success. The Maidstone Hilton provided a fantastic location for the event, with everyone commenting on the high quality of the location, facilities and staff – as well as the food! 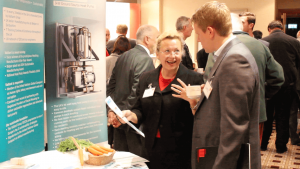 Once everyone had fuelled themselves with the tasty food the morning sessions began, with educational talks and discussions designed to give everyone a whole new insight into the world of heat pumps. All of the guests who attended on the day were thrilled to receive a special event goodie bag from the Reina Group team, including everything from bottle openers and trolley tokens to memory sticks, stress balls, pens and notepads and even earth-friendly shopping bags to help you ditch those plastic carriers! 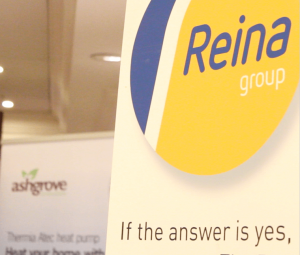 All of the guests who came to the Heat Pump Conference commented on the success of the event, with the real highlight being the attendees expressing just how much they had learnt. 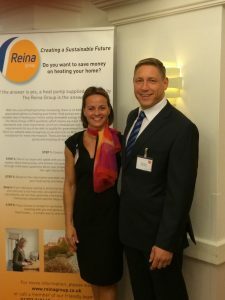 Reina Group owners Ricky and Charlotte Reina were thrilled with how the day panned out, and we would love to do it all again next year.